Pedal Control Drum Book/CD – Renowned educators Dom Famularo and Joe Bergamini (along with StΘphane Chamberland) have teamed up to bring you a complete method for improving the ability of your feet on the drumset. 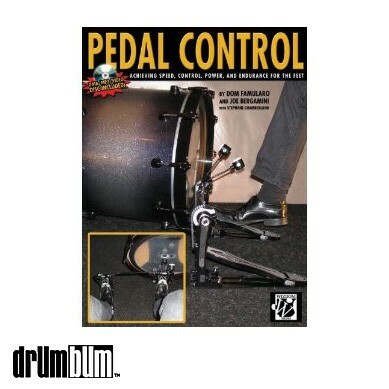 Unlike many other books, Pedal Control contains extensive information about the actual pedal strokes and techniques used by some of the worldÆs top drummers, in addition to dozens of exercises that will help you use these techniques. This book contains dozens of photographs that show the four pedal techniques discussed and the motions for various exercises. Also included is an MP3/data disc that contains over 200 tracks demonstrating nearly every example in the book, and high-quality QuickTime videos showing all the pedal stroke techniques! Softcover Book approx. 9″ x 12″ and 75 pages.